Many people learn how to sew for simple tasks like being able to sew on a button or make small repairs. For those of us that are on the shorter side, learning to hem is very important. There's nothing fun about needing to constantly hem jeans but it doesn't have to be difficult or frustrating. 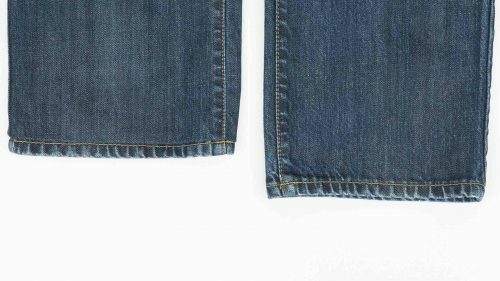 In fact, you can hem your jeans and keep the original hem, instead of cutting off from the bottom and creating a whole new hem. The reason to keep the original hem is that you're maintaining the factory created distressed hem that gives your jeans the professional look. Your jeans will be shortened to your custom height, as if you had them created just for you. If you look at the hemline really closely, you'll see where it's been shortened but, at the glance, no one will know but you. Great technique. Excellent instruction. Thanks. thanks heaps. will try the alteration tomorrow. What a great alteration lesson! This “invisible” technique will go a long way to satisfying the fashion demands of those receiving the hand-me-downs in our family – and help to pad our budget too!